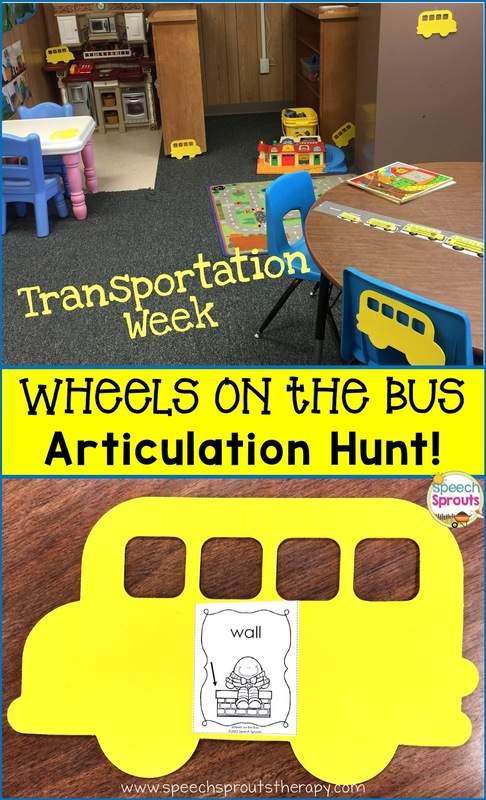 Speech Sprouts: Wheels On The Bus- Transportation Week! We were singing Wheels On The Bus all last week. 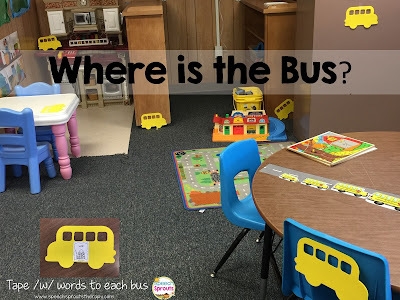 What a perfect rhyme for teaching bilabials and it fits right in with a fun transportation theme! This year I have many new little ones that need the basics articulation-wise. We are working on bilabials /w/, /m/, /b/ and /p/. 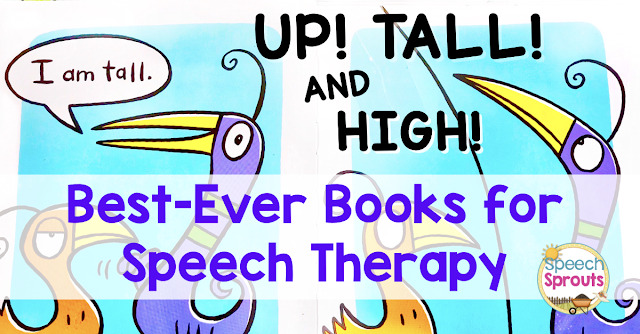 This theme gave us lots and lots of repetition of those initial /w/ and /b/ sounds. We did some category work as we talked about vehicles that have wheels and vehicles that do not. Cars and bikes and even planes (the pre-schoolers debated that one). and showed it on my smartboard with my large group of preschoolers as we sang the song. I showed it on my ipad later with my kindergarteners and first graders. 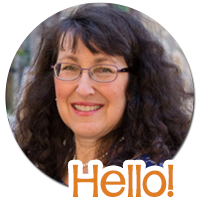 You touch the vocabulary picture or arrow to advance the page. The vocabulary is repeated on a "cheering" page. Yippee! Way to Go! You Found it! 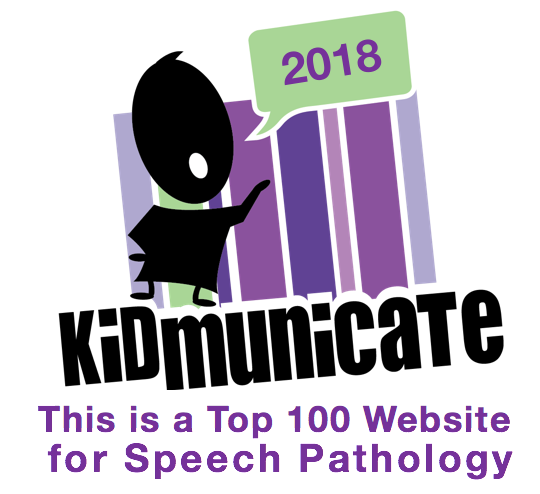 The vocabulary was easy but fun for my artic kids, and just right for my language kids. 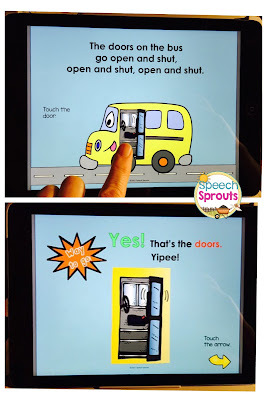 You can find the Wheels On The Bus Story separately, or as part of the whole Wheels On The Bus Interactive Speech and Language Activities pack at Speech Sprouts. It was a big hit. We sang the song as we found each vocabulary word: wipers, doors, mommies and of course crying babies going wah, wah, wah. Seriously, I must have sung that song 100 times last week. It...is...stuck in my brain! 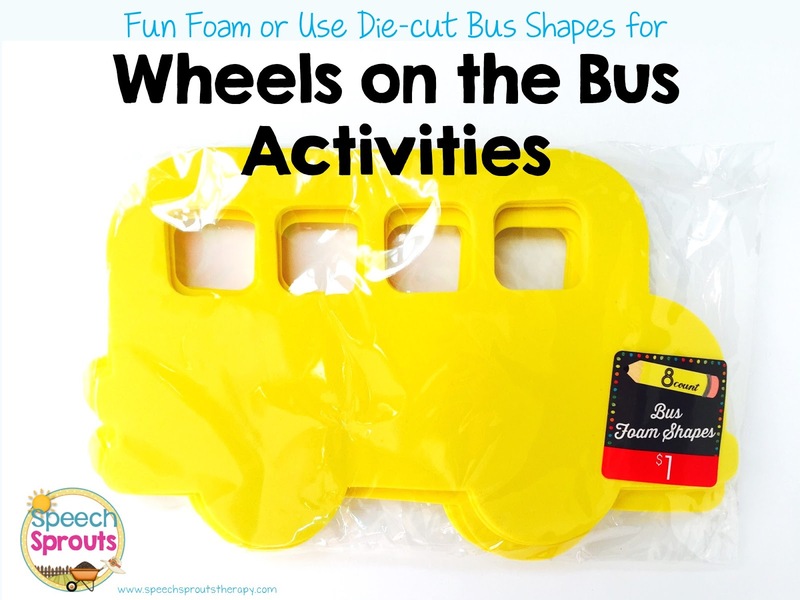 Foam or Die-Cut Bus Shapes For Fun Activities! 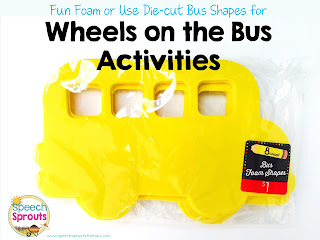 I found these great foam buses this summer at Target in their dollar bargain aisle, I printed out some initial /w/ pictures, taped them on each bus, and placed the buses all over the room. ( If you can't find the foam buses, die-cut buses would work great too). After the story, we worked on where questions. "Where is the bus?" Each child got to go get a bus, bring it back, tell where they found it, and announce what picture they had... "I have a wall on the bus". Anytime they get to get up, run around the room, it's a kid-approved activity for sure. We worked on half-whole and matching with these great transportation puzzles. 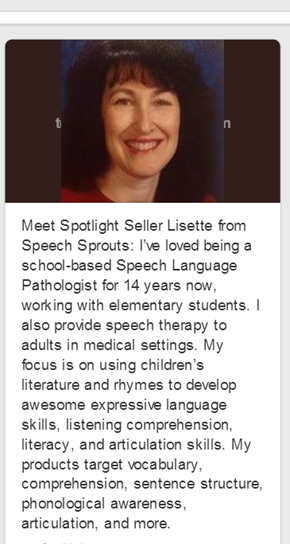 This unit lasted me the whole week with my pre-k to firsties. We made minibooks, followed directions, and talked about same and different. We decided who? was on the bus. 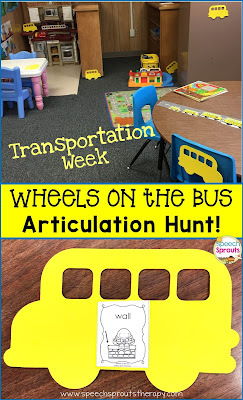 My kinders loved coloring their bus and outfitting it with wheels that really went round while they practiced telling who? and where? We sequenced buses by size and decided which was first, second and so on. This activity was also great for comparatives and superlatives: small, bigger, biggest. There were plenty more language activities to meet everyone's goals: following directions, same/different, sound sort, and questions. By the end of the week, I admit it, I got more than a little tired of buses! But the kids never did. And I loved how easy it was to plan out the week. I get overwhelmed sometimes in September and October. Lot's of gnashing of the teeth as I look at my bulging calendar. Maybe you do too. It's pretty tough with scheduling, new students, evals, ARD meetings, RTI meetings and of course Medicaid billing in addition to therapy. I'm really happy when I can grab one themed unit, and make it work for the bulk of my week. So I packed plenty in this unit, and it helped me breathe a little easier. If you would like to take a better look at this pack, click here for Wheels On The Bus Language Activities. I'm looking forward to pumpkins and spiders in the next few weeks, how about you? Thanks for stopping by!